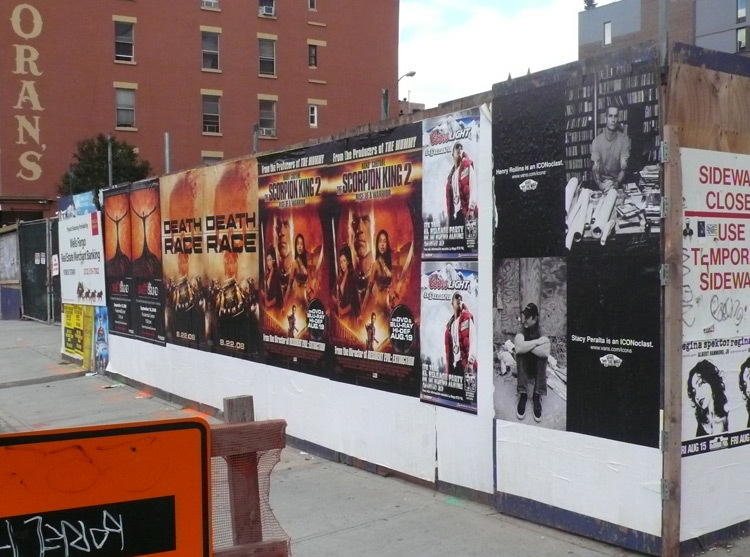 For the longest time I have wondered whether or not the rampant posting of advertisements on outdoor construction site walls was somehow legal in NYC. Recently I had the opportunity to discuss this with a construction site manager who made me aware of the Department of Buildings rules and regulations on the subject. It is illegal to post advertising on the structures surrounding construction sites for companies other than those operating within the property. At a building construction site the only operational company is the owner of the property and the construction company, making all other posting illegal. I was then informed that despite this guerrilla posting being illegal, the responsibility of complying with DOB regulations regarding signage rest not on the company doing the postering, but the company managing the construction site. Perplexed by the absurdity of this fact, I remarked that "one would have to employ an individual full time just to remove this illegal imagery." My new friend laughed and then agreed, complaining, "I can't do that." I then walked out of my studio to get lunch and watched a man in broad daylight postering a construction site with Y-3 advertisements. Why are these companies, that are behaving in exactly the same legal manner a street artist would, not responsible for their actions? Why are these people doing the postering not treated like a graffiti artist would be in the face of the law? This is a clear instance of the corporate world being able to exercise a great amount of power over how public space is used, while individuals are pushed further and further to the margins of public space.